We’re always being filled, but with what? What is God like? Is he an angry deity, eager to pour out his wrath on sinners? Or is he a loving Father, seeking to save all of his lost children? And where do we look to determine what God is like? To the Bible, certainly, but to which parts of the Bible? Do we look to Psalm 7:11–12, where “God is angry with the wicked every day,” and “If he does not repent, he will sharpen his sword”? Or do we look to 2 Peter 3:9, where God “is patient toward you, not wishing for any to perish but for all to come to repentance”? Do we look to 2 Kings 1:10–12, where Elijah prayed, and “the fire of God came down from heaven and consumed” over a hundred men? Or do we look to Luke 9:54–55, where Jesus rebuked two of his disciples for suggesting such a thing? If we try to take every verse of Scripture at face value, we’re going to come to some strange conclusions. Maybe God is bipolar, or maybe his nature changed between the testaments, or maybe the Father is wrathful while the Son is loving? Obviously, such conclusions are not options within the realm of Christian orthodoxy. So when we look for God in the Bible, we must start with Jesus as the center of all revelation. Everything else must be interpreted in his light. This is the kind of stuff I’ve been processing lately. Folks like Greg Boyd, Brian Zahnd, and Derek Flood have also been capturing this vision of a Christlike God, and I’m immensely grateful for their contributions to the discussion. But what I’ve not previously seen is a broad theology to flesh out the details and bring the various pieces together. And this is what we find in Brad Jersak’s recent book, A More Christlike God: A More Beautiful Gospel. His is not an academic book (though ample references to academic works are provided). Rather, A More Christlike God is pastoral in nature, geared toward those readers who may be struggling with false images of God. At the same time, speaking as one who started the book in basic agreement with the premise, I still found plenty of things to challenge my current understanding and to push me closer to our beautiful, Christlike God. I wholeheartedly recommend that you read A More Christlike God, no matter what your view of God may be. Agree or disagree, you won’t finish this book without at least having some things to think about. On a personal note, for those of you who may be struggling with some of my theological changes or wondering how I’ve come to the conclusions I have, this book may go a long way toward helping you at least understand where I’m coming from. 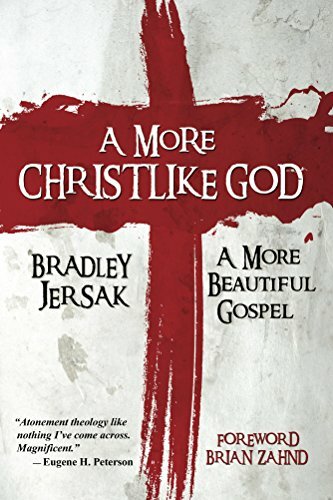 Brad Jersak has put forth my own theology in a far more eloquent manner than I’ve been able to describe thus far. Of course there are differences here and there between Brad’s theology and mine, but on the whole, he has perfectly captured and explained the essence of what I believe to be true about God. Disclosure: the publisher, Plain Truth Ministries, sent me a free copy of the book in exchange for an honest review. Pick up your copy of A More Christlike God as a paperback or a Kindle eBook. This is the former blog of Chuck McKnight. Follow my new blog at HippieHeretic.com. Many of my views have changed over time, and I do not necessarily still agree with everything that is written here at Being Filled. In some cases, I now disagree strongly with my former views. Take what you read here with a grain of salt.